Elton John isn't expecting much from this year's Super Bowl Halftime Show, but it's not all Madonna's fault. On Good Morning America Monday, John insisted, "I've never seen a decent [halftime performance]. Never ever." Also, Madonna's releasing a teaser of her new music video on American Idol, Jennifer Lopez says she may never marry again, and Christina Aguilera had a fight with some fake tanner. • When stars land major endorsement deals, they're paid not only to shoot commercials, but also do the press rounds to promote those commercials. That's why Elton John was on Good Morning America this week: He's raising the profile on his Pepsi commercial. He's also sniping about Madonna. When asked to give the Queen of Pop some advice before her halftime show at Super Bowl XLVI, he quipped, "Make sure you lip-sync good." John's classic sadface. (via YouTube)1. Told Carson Daly that Madonna didn't have a "f**king chance" of winning Best Original Song at the Golden Globes. 2. Gave major sadface after Madonna won. 3. Failed to comment after his husband ranted on Facebook, "Madonna winning Best Original Song truly shows how these awards have nothing to do with merit. Her acceptance speech was embarrassing in its narcissism." There's more than professional jealousy at the heart of this feud: John likely feels the need to protect his close friend Lady Gaga, about whom Madonna has said some pretty nasty things as she attempts to drum up press for her film W.E. before its release. 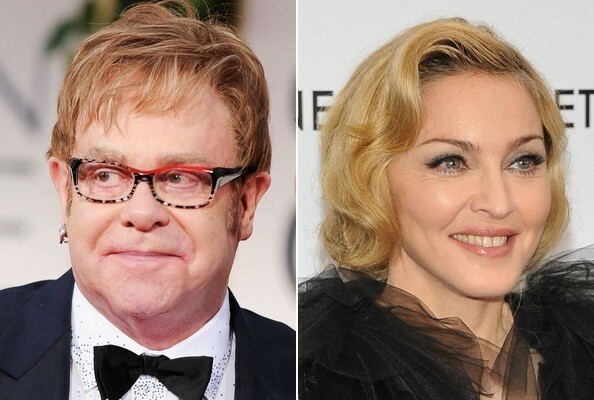 Madonna has remained cool about Elton's comments, telling reporters backstage at the Golden Globes, "I hope he speaks to me for the next couple of years. He's been known to get mad at me so I don't know. He's brilliant and I adore him so he'll win another award. I don't feel bad." • Madonna's marketing team is taking the blitzkrieg approach this month. If you're not already sick of hearing about the movie or the halftime show, check out this commercial for a preview of her new music video for "Give Me All Your Luvin," which will air during American Idol on Thursday. Because even teasers require commercials these days. Ugh. • More evidence that Beyonce is the most important person in the universe: Her life and work is the basis for a course at Rutgers University. Doctoral student Kevin Allred is teaching a course called "Politicizing Beyonce," which explores the singer's career within a gender and race studies framework. I sincerely hope there's an entire section of the syllabus dedicated to probing lyrics like, "Is my body too bootylicious for you babe?" • Christina Aguilera covered Etta James' "At Last" at the late singer's funeral over the weekend, but all that oversinging was overshadowed by the thin stream of ick that made its way down Aguilera's leg. Fake tanner: Not a good idea right before a big performance! • It might seem like getting married is Jennifer Lopez's favorite thing to do given her track record, but she doesn't know if she'll ever walk down the aisle again. "It's not time to think about that yet," she demured on the Today show. "It's still fresh." • LMFAO doesn't care much for subtlety. DJ Redfoo (Stefan Kendal Gordy) and DJ SkyBlu (Skyler Husten Gordy) of LMFAO are in high spirits as they prepare to depart from Nice Airport.